One of my favorite annual holiday traditions is wreath making at the farm. Each year we refine our process a little bit more, but it's always a fun time! Typically the ladies in the family (my mother-in-law & sister-in-law) go the weekend after Thanksgiving. We take the four wheeler out into the woods and trim the branches that flow over into the trail. We clip a mix of spruce, white & red pine, and cedar. Mixing the different varieties gives the wreath great texture and fullness. We lined our tables with cedar sprigs at our wedding, so now the smell of them evokes fond memories of our big day! We carefully layer on each sprig to the form and wrap it with green floral wire. All while listening to old Christmas CD's and drinking hot cocoa or spiked apple cider. our family's sweet vizsla puppy wanted to help! the finished product (& a snow day)! The first year I made one, I mailed it to my mom & dad in Florida. It was super-heavy and ended up costing nearly $60 to ship.. whoops! But in all seriousness. I love this tradition. It forces us to slow down, go outside, and enjoy the holiday season at it's most creative! 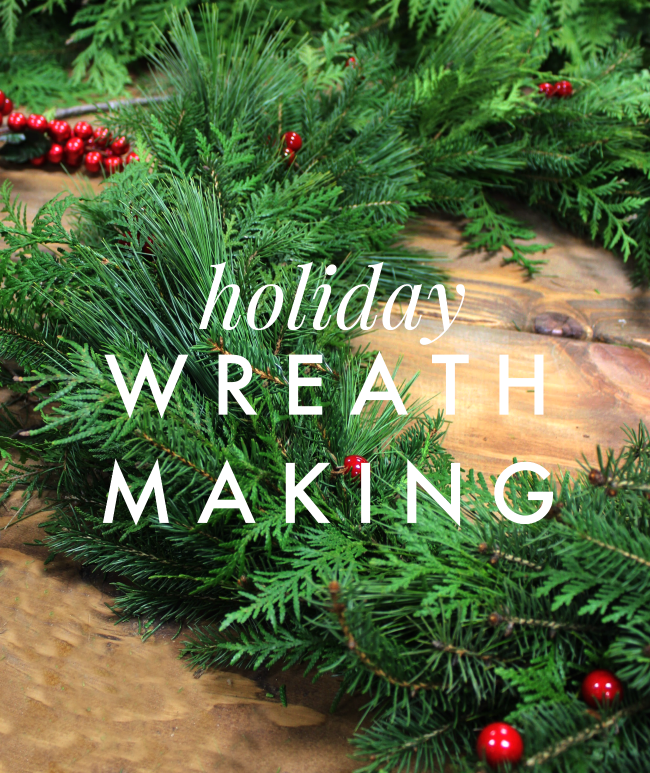 Next year we're planning on having a workshop at the farm to extend our family tradition to others to learn how to make their greenery wreaths and swags. We hope we'll see you there!